The xXLecXx Ransomware is a computer virus of unknown origin that encrypts user data and extorts the victims for a ransomware fee, affected computers can be restored by reading our removal guide. How Does xXLecXx Ransomware Infiltrate the System? 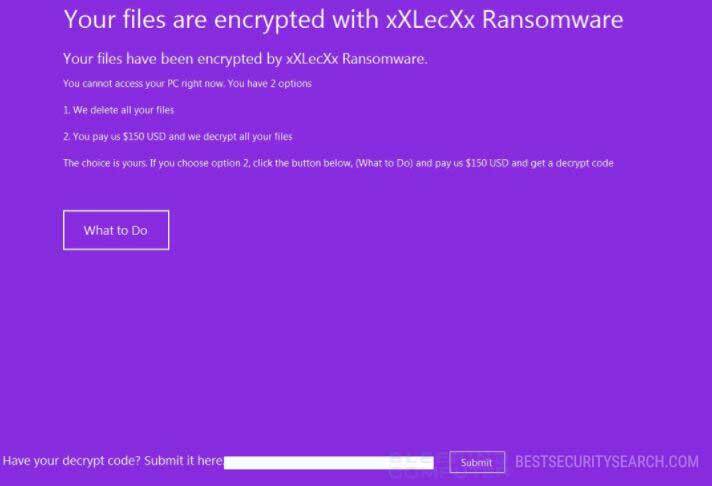 xXLecXx Ransomware samples can be delivered by different means. One of the most common strategies is the creation and coordination of email spam campaigns that feature social engineering tricks. The aim of the hackers is to make the victims infect themselves with the xXLecXx virus by opening file attachments or links inserted in the body content. The messages pose as being sent by a legitimate company or government institution and is usually done by designing templates and inserting graphics and text that resemble the real companies. The xXLecXx Ransomware payload can also be hosted on hacker-controlled or hacked download sites that may resemble legitimate sources. Based on the infection plan the xXLecXx virus code can be bundled in software installers or documents. Other methods include direct hacker attacks, browser hijacker deployment and automated software vulnerability attacks. Security analysts detected a new computer virus of unknown origin called the xXLecXx ransomware. During the initial analysis they found no code obtained from any of the well-known malware families. This means that the hacker or hacker collective behind it programmed it themselves. It is a basic threat that contains only an encryption engine that is automatically started after the infection has been initiated. At the moment the captured xXLecXx virus samples were found to be in a testing phase. This means that the currently released attack campaign cannot effectively process the user and system data. We suspect that any follow-up updates will remedy the situation and the xXLecXx Ransomware will cause devastating effects on the compromised computers. Typically viruses like the xXLecXx Ransomware target system and user data based on a predefined list of file type extensions. In the majority of cases this includes the most widely used files: documents, archives, backups, photos, videos, music, configuration files and etc. Depending on the configuration a mark extension can be used to signal the processed data – for example .xXLecXx. The xXLecXx virus can also use other generic extensions such as locked, encrypted and so on. Your files have been encrypted by xXLecXx Ransomware. 2. You pay us 150$ USD and we decrypt all your files. The choice is yours. If you choose option 2, click the button below, (What to Do) and pay us $150 USD and get a decrypt code. The hackers use a common blackmail strategy by explaining that the victims have been infiltrated by the xXLecXx Ransomware. They request the sum of 150 US Dollars however the criminals have not specified the payment method. A future update of the xXLecXx virus will probably feature a working encryption process and a new note detailing how the payment is done. We suspect that the hackers are going to insist on using the Bitcoin digital currency as all transactions done with it cannot be traced and remain anonymous. Virtually all malware like the xXLecXx virus use this payment method. The victims should not pay if they are infected with a virus such as the xXLecXx Ransomware. A quality anti-spyware solution can restore the affected machines and with the use of a professional-grade data recovery product the files can be recovered. WARNING! Manual removal of xXLecXx Ransomware requires being familiar with system files and registries. Removing important data accidentally can lead to permanent system damage. If you don’t feel comfortable with manual instructions, download a powerful anti-malware tool that will scan your system for malware and clean it safely for you. WARNING! All files and objects associated with xXLecXx Ransomware should be removed from the infected PC before any data recovery attempts. Otherwise the virus may encrypt restored files. Furthermore, a backup of all encrypted files stored on external media is highly recommendable.